Transperitoneal access can be obtained, and the primary port is inserted at the lateral border of the rectus muscle just above the level of the umbilicus. We prefer a 12-mm blunt tip trocar as our primary port. Carbon dioxide is insufflated to create a pneumoperitoneum up to 15 mmHg. A 10-mm 0° laparoscope is inserted, and the underlying bowel is inspected for any injury that may have occurred inadvertently during port placement. 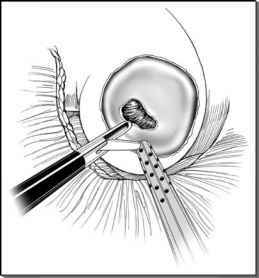 Subsequently, two additional 5-mm ports are placed under direct laparoscopic vision. A second port is placed 2 cm below the costal margin in the midclavicular line. The third port is placed in the anterior axillary line between the costal margin and iliac crest.